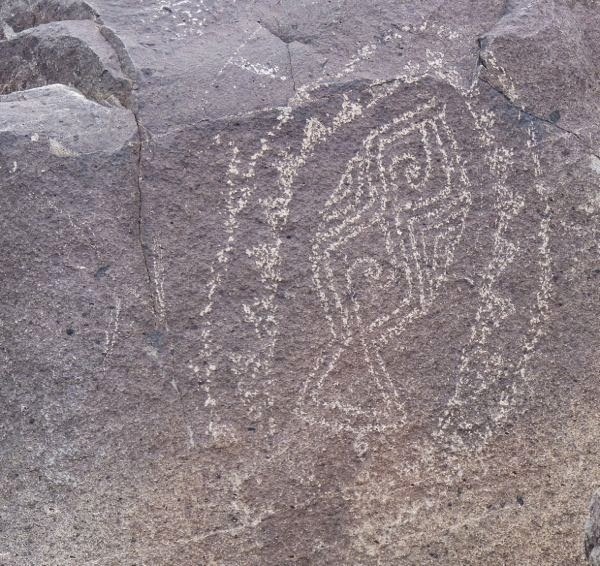 The BLM manages the Three Rivers Petroglyph Site, containing over 21,000 rock art carvings, and a partially excavated prehistoric native village. 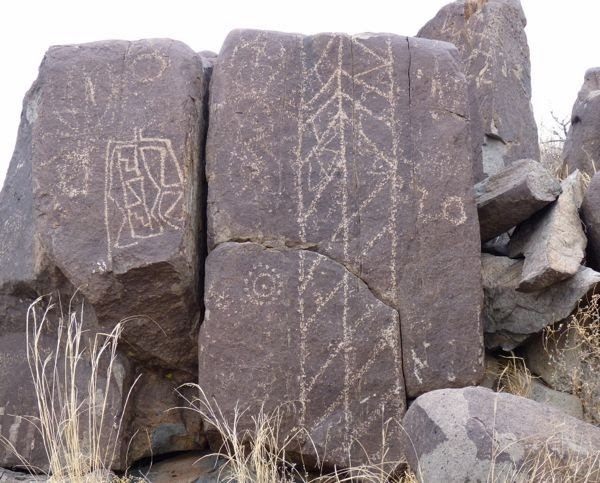 It is believed to be from the Jornada Mogollón people from around 1,000 years ago, or there about. 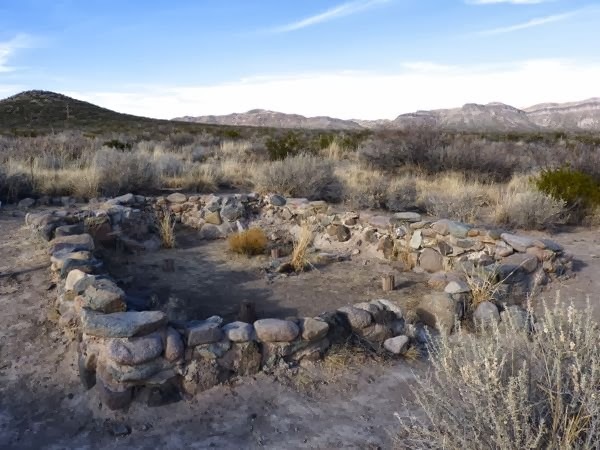 From the campground, a short flat trail into the desert takes you to the village ruins. There are just three uncovered foundations of native shelters. Nearby is a stream that would have provided water for the people, their crops and animals. Your imagination will have to suffice for how the village actually appeared. 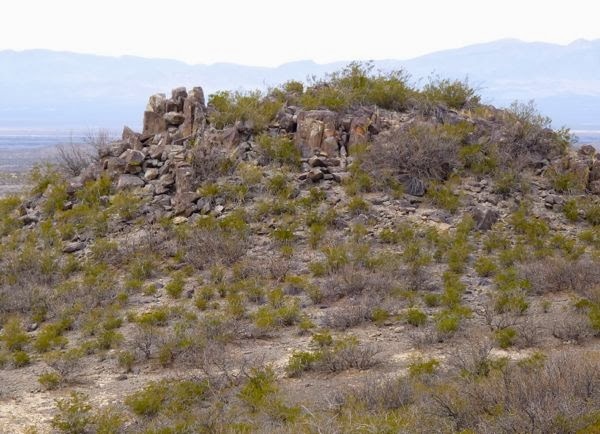 Another trail goes up a hill where a multitude of petroglyphs can be found. It seemed like every other rock had a drawing; small, big and bigger rocks. Some images were clearly seen, and others barely visible. The larger rocks had multiple drawings. There was some repetition in images, but none were identical. Most were stylized, but a few made an attempt at drawing naturally. Subjects included animals, reptiles, birds, people, sun, moon, clouds, geometric designs, etc. 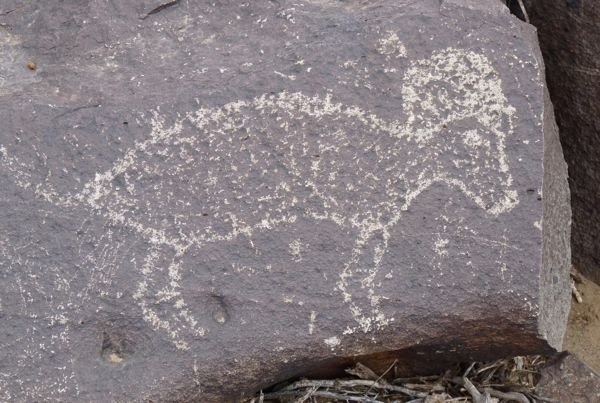 Walking along the trail, I took 147 shots of petroglyphs; so, I probably missed a few. 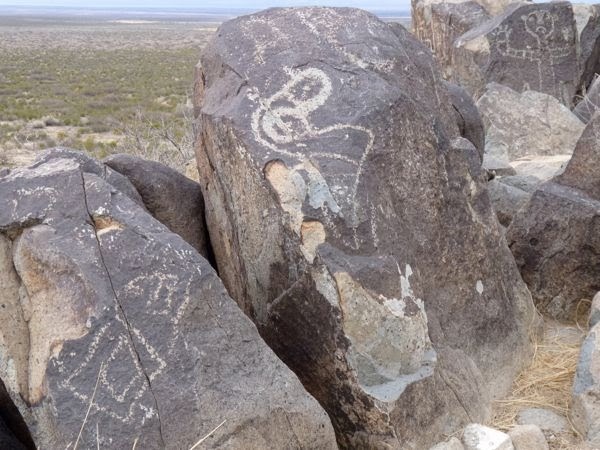 Most of the petroglyphs are concentrated in the first half mile of the trail; after that, they become sparse. There’s a shelter to rest at that point, and the return trip has a few side routes to take. Lots of looking and not much hiking. I stopped for a snack. It appears that the native artists created an art museum on the hill near their village. Talk about culture! The day was overcast, cool and breezy so the hike was easy. I dry camped there for two days while I explored. Noone else camped, although several visited to see the glyphs. It’s well worth the trip if you like historical sites. Amazing that the petroglyphs are still there and so plainly visible. Makes you wonder about the intent of the people who made them – did they do it for artistic reasons, as a historical record, for pure enjoyment, or what? That is something they don’t understand. They have never been able to decipher the symbols. Perhaps just a giant coloring book? It sure does Brad. There is a creek nearby, so the natives may have had a fishing hole. Love the pictures, I can almost hear a slight wind and the dry grasses brushing against the rocks. Brad, just a fish picture, not as sign pointing to a lake, although the rocks below that fish may indicate 4 by 4 needed, heavy duty all terrain tires. lol. The place does have a special feel to it. It’s amazing what they have done.